BLF Activities Published by “Ashoob” from the statements of BLF spokesperson Gwahram Baloch issued in Electronic and Print Media. During the month of July 2017, 42 attacks were carried out on Pakistani forces. More than 27 soldiers were killed, dozens injured, 9 military vehicles destroyed. One attack was carried out on Pakistan army’s construction company Frontier Works Organization (FWO), working on China Pakistan Economic Corridor (CPEC) projects, one (FWO) personnel was killed and one injured. 5 attacks carried out on Pakistan Army’s death squads, 2 militants of ISIS affiliated terrorist organization were killed and 4 injured. In the month of July, three BLF fighters Zareef Baloch, Saleem Baloch and Sameer Baloch embraced martyrdom in Dasht district Kech while defending motherland Balochistan against Pakistani forces. They fought bravely for the freedom of their country and the nation, who demonstrated the true meaning of sacrifice. We will remember them with eternal respect and gratitude. Their sacrifice will forever be etched into the history of Baloch resistance. 01 July 2017 - Two military personnel killed in a sniper attack on Pakistan military check-post in Sahaki area of Baalgatar district Kech, Balochistan. 02 July 2017 - One military personnel killed in a sniper attack during picket security of Pakistan military convoy in Sorak area of Dasht district Kech, Balochistan. 03 July 2017 - AttackedonPakistan military convoy with heavy and automatic weapons in Kanerah area of Peerandar district Awaran, Balochistan, one military vehicle destroyed and several killed and injured. Attacked on Pakistan military convoy with heavy weapons in Galhi area of Buleda district Kech, Balochistan, and several military personnel killed and injured. Attacked on Pakistan military with heavy weapons when building a checkpoint after occupying a school in Gashanag area of Kolwa district Awaran, Balochistan, several killed and injured. 21 July 2017 - One military personnel killed in a sniper attack in district Khuzdar, Balochistan. Attacked on 15 Pakistan military soldiers on the fort with heavy weapons in Gashanag area of Kolwa district Awaran, Balochistan, several killed and injured. Attacked on Pakistan military check-point with heavy weapons in Gashanag area of Kolwa district Awaran, Balochistan and inflicted heavy casualties. Attacked on Pakistan military check-point with grenades in Lizzo area of district Khuzdar, Balochistan and killed one military personnel. 23 July 2017 - Attacked on Pakistan military check-point with heavy weapons in Gandchahi area of Kolwa district Awaran, Balochistan and inflicted heavy casualties. 26 July 2017 - Attacked and fired two BM12 on Pakistan military camp in Malar area of Balochistan and inflicted heavy casualties. Attacked and fired two BM12 on Pakistan military camp in Gishkor area of Balochistan, several killed and injured. 27 July 2017 - Attacked on Pakistan military convoy with heavy and automatic weapons in Talai area of Bazdad district Awaran, Balochistan, and killed two military personnel. 28 July 2017 - Planted a landmine and Targeted Jumma s/o Yar Muhammad and Hazbullah Khair Bakhsh death squad members affiliated with ISIS in Raghey area of Besema district Washuk, Balochistan. 30 July 2017 - Attacked on Pakistan military check-point with heavy weapons Chambur area of Kolwa district Awaran, Balochistan, two military personnel killed and several injured. Up until now his advisors have offered President Trump two choices for failure in Afghanistan, one quick, withdrawal, and one slow, a continuation of the failed strategy of the last sixteen years. By now it should be apparent to all knowledgeable people that U.S. objectives cannot be achieved in land-locked Afghanistan where Pakistan, whose Afghanistan objectives differ from ours, controls the supply of our troops and the battle tempo through its support of the Taliban and Haqqani network. An alternative is to provide the President with a 12 to 24-month plan that bridges the gap between the present untenable strategy to a longer term solution. That is, rather than tweak the current strategy, begin to address the core problem, a strategic environment that has made success of the current strategy impossible. Within the next two years, the Trump Administration should formulate a strategy that exploits Pakistan’s pain points, one which carves out roles for the Department of Defense, Department of State and Congress. While preventing a further deterioration in the security situation in Afghanistan, different permutations and degrees of the following actions should be pursued, both as short term leverage against Pakistan and, ideally, to create a regional strategic environment more conducive to U.S. interests. That is, it is not the Taliban and the Haqqani network that need to be brought to the negotiating table, but Pakistan. Foreign aid to Pakistan – reduce it to a trickle. Even Pakistan’s former ambassador to the United States says that a tougher approach needs to be adopted toward his country: “The Bush administration gave Pakistan $12.4 billion in aid, and the Obama administration forked over $21 billion. These incentives did not make Pakistan more amenable to cutting off support for the Afghan Taliban.”Major Non-NATO Ally (MNNA) status – cancel all or part of it. As a MNNA country, approved by President George W. Bush in 2004, Pakistan became “eligible for priority delivery of defense material, an expedited arms sale process, and a U.S. loan guarantee program, which backs up loans issued by private banks to finance arms exports. It can also stockpile U.S. military hardware, participate in defense research and development programs, and be sold more sophisticated weaponry.”Declaration of Pakistan as a state sponsor of terrorism – advance the House bill through Congress. On September 20, 2016, Congressman Ted Poe (TX-02), the Chairman of the House Subcommittee on Terrorism, along with Congressman Dana Rohrabacher (CA-48), introduced H.R.6069, the Pakistan State Sponsor of Terrorism Designation Act. According to Chairman Poe: “Not only is Pakistan an untrustworthy ally, Islamabad has also aided and abetted enemies of the United States for years. From harboring Osama bin Laden to its cozy relationship with the Haqqani network, there is more than enough evidence to determine whose side Pakistan is on in the War on Terror.”Durand Line – Pakistan depends on it – question its legitimacy. The Durand Line is the arbitrary 1896 border drawn between Afghanistan and Pakistan by British Diplomat Sir Mortimer Durand. Pashtun lands have been artificially divided and Pakistan is using its Pashtun population as Taliban cannon fodder.China-Pakistan Economic Corridor – undermine it. Pakistan has significant economic incentive to exclude western countries from maintaining any influence in Afghanistan. It is called the China-Pakistan Economic Corridor (CPEC), which is part of China’s larger Belt and Road Initiative that aims to connect Asia through land-based and maritime economic zones. CPEC is an infrastructure project, the backbone of which is a transportation network connecting China to the Pakistani seaports of Gwadar and Karachi located on the Arabian Sea. Gwadar is a potential Chinese naval base at the mouth of the Persian Gulf, which will complement another Chinese naval base in Djibouti at the mouth of the Red Sea creating two critical strategic choke points.Ethnic separatism – encourage it – Pakistan is the Yugoslavia of South Asia. Probably the greatest of all potential Pakistani pain points is ethnic separatism. Pakistan was founded on the religion of Islam and is composed primarily of five ethnic groups that never coexisted, the Bengalis, Punjabis, Pashtuns, Sindhis and Baloch. Pakistan’s Islamic nationalism program was specifically designed to suppress ethnic separatism, an effort that eventually led to the proliferation of Islamic terrorist groups within its borders and their use as instruments of Pakistan’s foreign policy. Exploitation of ethnic separatism within Pakistan, such as in Balochistan, remains an option. That is, fight an insurgency with an insurgency. A longer term solution for Afghanistan was described previously in the Daily Caller, one based on counterterrorism rather than counterinsurgency, providing a cost-effective, flexible and “conditions-based” strategy advocated by retired U.S. Army Major General Paul Vallely in a Diana West article. In terms of Afghanistan strategy, it is time to build a bridge to somewhere. The Gulf crisis, which began on June 5 when four Arab states launched a sudden and comprehensive boycott of Qatar, has thrown the country’s regional relations into disarray. In an effort to placate its enemies without losing face, Doha will seek to curb financing of Islamist groups, tinker with Al Jazeera’s editorial guidelines and expel opposition activists from other Gulf states. It will prioritise ties with Washington as the best possible route to resolution. 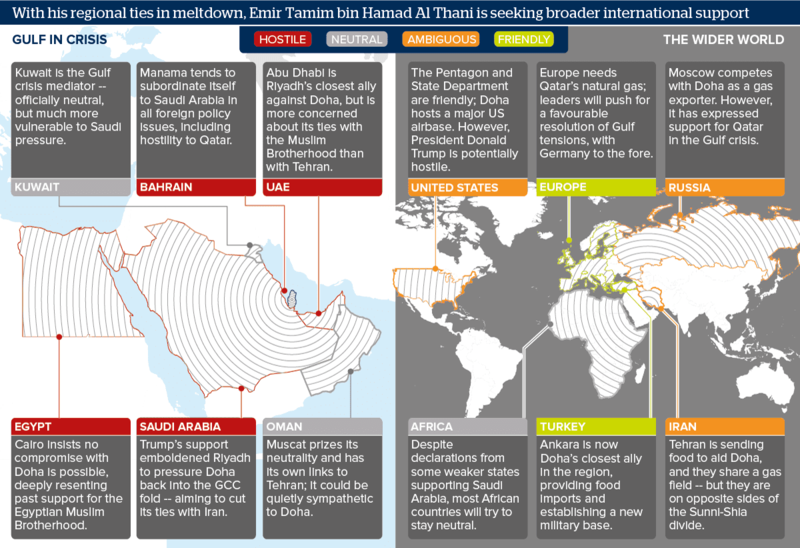 However, Qatar’s enemies are determined to see a public end to its long-standing ‘independent’ foreign policy. They will likely fail to bring its actions into line with the GCC leaders, but could exact a high economic price. Greetings from the Hind-Baloch Forum. We are going to celebrate 'Raksha Parv' on the auspicious day of Rakshabandhan to strengthen relationship between Hindustan and Balochistan. Baloch sisters will tie Rakhi to Indian Flag and Indian brothers. Hind-Baloch Forum is established by eminent Indians who love their Motherland along with freedom fighters of Balochistan. We support our Baloch friends against the illegal occupation of an Independent State Balochistan by Pakistan. We oppose the brutal violation of humanity in Balochistan. Baloch people deserve a life with sovereignty, dignity and prosperity which Pakistan is hindering. We are looking forward for your gracious presence at the event. In first two parts of China Vs Jinping, we have analysed fallouts of Jinping’s anti-corruption purge of politico-military leadership and his merciless crackdown on Military Business Empire of People’s Liberation Army including huge human organ trade and transplant industry. Both steps have created much uproar in China as those arrested and prosecuted in the sweeping campaign were powerful in their respective fields. After assuming the office, Jinping had vowed to catch “Tigers and Flies” engulfed in corruption, which was veiled reference to all ranging from “Top to Bottom” irrespective of their position, fame, persona and honour in public and party life. In this paper (3rd in a series) we will go through Jinping’s ambitious structural reforms in Chinese armed forces on command and organizational level, integration of all services into one, cohesive, tri services integrated theatre command abolishing supremacy of PLA commanders, dominated by infantry officers. These reforms are similar to US reforms of its armed forces which were based on United States’ The Goldwater–Nichols Act-1986, to solve the problems caused by inter-service rivalry and operational failures leading caused by such rivalry. Though these reforms are going to increase the efficiency of Chinese armed forces, it has generated resentment and backlash from mighty commanders of PLA. One more and probably most significant factor of Chinese military reforms are proposed a sharp cut in PLA strength. The containing PLA strength from 2.4 million to 1 million over a period of time is biggest and boldest step taken by Jinping immediately after taking over as Chinese President. There are many angles to this move and many theories propped up from a Western and American analyst. The most significant and logical conclusion was, fear in Jinping’s mind about PLA’s wealthy and powerful generals! We will try to find out whether the fear has anything to do with reality or not. China is the country governed by a single party. The Chinese media is only state run newspapers and TV channels pouring in information which party wants to disseminate. Every word and case is being strictly monitored and censored. Utmost care is taken not to transmit any information which is detrimental to party’s image. But, the scale of Jinping and PLA is such a high and tensions between two camps are unprecedented that PLA’s mouthpiece daily People’s Daily blatantly attacked Jinping over reforms in armed forces. In November 2015, when structural reforms were already declared and the majority of the Chinese including PLA, were yet to judge Jinping’s capacities People’s Daily- the mouthpiece of PLA committed a serious offence. The two authors associated with PLA Academy, Mr Sun Kejia and Mr Han Xiao lashed out in clear words at proposed military reforms. They warned of serious consequences if proposed military reforms were pushed through. Later the article was pulled down from the website after much uproar. Surprisingly, even after taking on practically omnipotent Jinping, no one could harm any one of the two authors, which launched a scathing attack on Jinping. The reason behind the immunity which both authors enjoyed is not known but it is not impossible to judge. Though publicly just two authors were visible attacking Jinping’s policies on military reforms, everyone in China knows that they were voicing the opinion of thousands of PLA ranks against the possible axing of their jobs and stripping them of various privileges which they were enjoying these days. In China, such direct public expression of opinion was unusual and hard to believe! Military reforms envisaged by Jinping would see the slashing of PLA strength from 2.4 million to just 1 million within next few years. It means half of the PLA troops would lose their jobs. Moreover, new theatre command structure will take down army’s supremacy within armed forces. Though these reforms; if actually executed successfully, would convert Chinese armed forces in lethal, formidable and most professional fighting machine in the world. The initial indications and structural, psychological and practical deficiencies in the system suggest that reforms are going to hit hard rock. The central theme of military reforms is converting military from “quantitative” to “qualitative” force. But what is going actually going to be on the ground is huge cuts in infantry combat troops and a simultaneous increase in naval strength, rocket force and strategic support forces. Obviously, infantry is the biggest loser in this exercise. The New Joint Theatre Commands consisting Eastern, Southern, Western, Northern, and Central commands will rearrange troops and resources in respective areas and merge it within the single homogeneous structure to boost mobility, pace and proficiency of the troops by integrating all resources into one cohesive unit. The theme is based on American Goldwater–Nichols Act-1986, which would continue to appoint three services chiefs, but none of the three chiefs would have any operational power. They would cease to be the advisers of Central Military Commission and President. This whole power will be consolidated in the hands of CMC head and Commander-In-Chief. As an ultimate fallout of demobilized Chinese soldiers after the restructuring of PLA, the large scale unrest growing among those who lost the jobs. In October and November 2016 two protest marches were called at powerful Central Military Commission HQ in Beijing to demand compensation and penalties for snatching their jobs in new military reforms. On October 11, 2016, near about 30,000 demobilized troops took part in a protest at CMC headquarters in Beijing. Another protest on November 01, 2016 vanished under media blackout as the government imposed stringent prohibition orders on covering the protests fearing its spread. Why Jinping Reminded Army of Party Supremacy? Xi Jinping reviewed military exercise to mark the 90th anniversary of People’s Liberation Army this week. While addressing the troops he reminded the military of “Gutian Congress” Principle of party’s supremacy over the military. He told PLA to ‘uncompromisingly follow Communist party leadership and it shall march wherever Party points too’. Many believed that deep sense of mistrust and insecurity in Jinping’s psyche about PLA has forced the president to speak it up. Recent aggressive steps taken by Jinping which directly or indirectly hit vested interests of military commanders has placed him at loggerheads with men in uniform. The balance of power hangs in imbalance as uncertainty looms over Jinping’s career due to his consistent campaign against powerful party leaders and military commanders. It would be interesting to watch the events in China in next one year to wait and see which camp turns the table and whether Jinping tightens the grip or loses the game. In April 2016 Jinping officially took charge of the chief of newly formed Joint Operations Command Center of Chinese Armed Forces. Though, being president of China, he was chairman of Central Military Commission- CMC, the latest installation of Jinping as Head of JOCC has far reaching implications. China is economically sharply divided into two distinct parts; wealthy, industrious and rich coastal China and poor, underdeveloped and impoverished hinterlands. The majority population in China is living in poor and underdeveloped rural China. The Great Equality Utopia assured by glossy Communism has already waned away. The wealthy coastal area has economic bonds with Europe and USA and they have nothing to do with Chinese masses. Under such circumstances, it is a difficult task for Jinping to control brewing anger among rural Chinese masses, which were the backbone of the Chinese revolution. Xi Jinping’s biggest concern is to monitor and quell any future turmoil which would come to fore either slowly or in the form of a huge outburst of public anger. Jinping wants Communist Party to control it. But biggest hurdle in quenching the fire is PLA and paramilitary troops. After ruthless crackdown on so called tainted commanders, former security Czar, two former vice chairmen of Central Military Commission, dismantling lucrative military business empire including PLA controlled medical facilities and dismantling monopoly and dominance of PLA in Chinese Armed Forces; Jinping needs more operational control over its forces, to keep vigilant eye on day to day affairs related to troops movements. The composition of Chinese Armed Forces is also mattered of concern for Jinping. The majority of the Chinese troops are from Chinese hinterland which is deprived rich dividends of economic boom in the country and wealthy coastal region has a very negligible presence in forces. The huge economic disparity and wealth imbalance within two regions might trigger a chain of reactions in PLA, with the majority of the troops from the largely backwards region. The sharp reduction in a number of troops would add to Jinping’s woes. As being autocratic country; expectation of fair compensation to troops removed from forces is somewhat unrealistic and it would hardly address in a country like China. On The Other Hand, wealthy China is a potent threat to the Communist regime for a very strange reason. China watchers believe that real motive behind anti-corruption blitzkrieg is to warn wealthy Chinese and to deliver them subtle message to refrain from indulging in party affairs with enough financial resources in hand. In near future, Jinping might think of taking control of private assets to distribute it in the regions facing financial imbalance. To achieve it, he must have full control over its armed forces for dual purpose; to monitor and thwart unrest within PLA ranks deriving from peasant class and to pressurize affluent class from becoming dominant over party and policy makers. In one more direct bold move, Jinping hit most dangerous conglomerate of influential people in China. In January 2016, he installed Discipline Inspection Commission under the direct control of Central Military Commission specifically for corruption related to PLA ranks. PLA commanders with deep pockets and cross sectional influence across all spheres of industrial, commercial and Chinese elites are real time treat for Party in general and Jinping in particular. Within just a few months of the establishment of DIC, hundreds of PLA officials are purged from top to bottom. The message was open and out to all PLA bigwigs- “fall in line or get prosecuted”. After years of career in PLA, there would be hardly anyone in the military with Mr Clean image, especially at the time when the military was running thousands of industrial, commercial enterprises all over China. As a Head of Joint Operations Command Center means Commander-In-Chief of Chinese armed forces; he is in a position to monitor every movement of PLA of any scale, which could threaten his regime. After unleashing terror within Communist Party and military in the name of big bang anti-corruption drive, Jinping has established his most trusted aids at all nodal positions to monitor any movement by party or military which could topple him! Present military reforms would take years to complete but its magnitude and number of people either losing their jobs or getting sidelined in due course will mount unbelievable pressure on the party and Mr President. 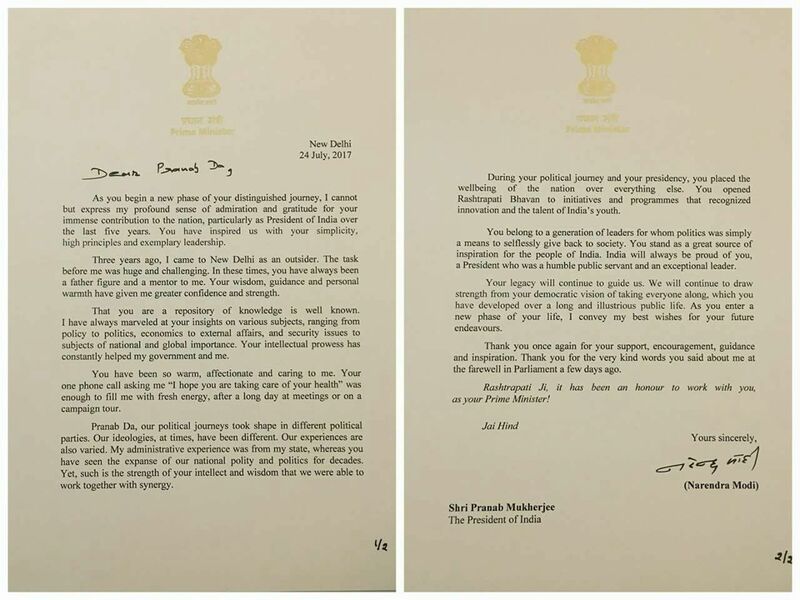 PM Modi sent this letter to Pranab Mukherjee on his last day at Rashtrapati Bhavan. Pranab da shared it on his twitter account. 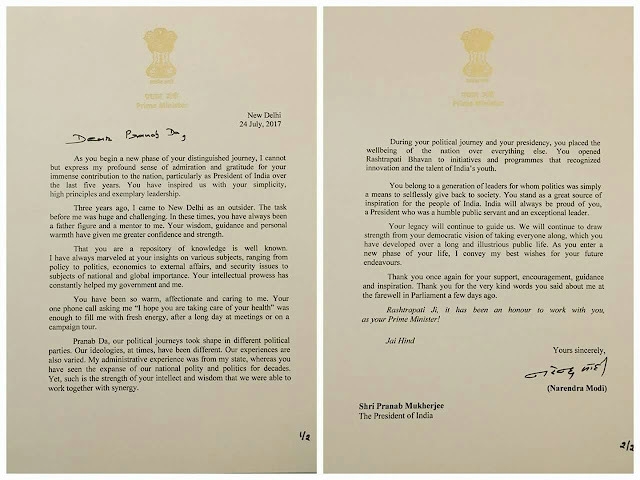 Best farewell letter you will read. According to some historical sources, in a sign of profound connection with the intensive presence of Balochi element in the military and security forces now, which is that the royal family hired a private military force of Baloch since the mid-nineteenth century, where those sources state that the Baloch tribes such as the family of Yousif bin Ahmed bin Fadel, the family of Al Barakat and the family of Rashid bin Saeed participated with Al-Khalifa the in the their internal and external. Interestingly here that Baluch tribesmen were among the approved types for the Gulf rulers as loyal combatants and can be relied upon in wars and skirmishes. Sheikh Mubarak Al-Sabah and the Sultans of Oman used to depend on them a lot in controlling the internal security and guarding the borders. Researcher Abdulla Saif points out in his article on the history of the Baloch in Bahrain that they and since ancient times practiced military actions, escorting the royal family, making and refining daggers and falconry which is loved by Arab tribes, especially the ruling family. One of the Baloch leaders who stood with Al Khalifa was Commander Ahmad Murad Al Balushi, who died after the Al-Khalifa entry to the country in 1788. After the stability of the security in the country and the fact that the Baloch were tough warriors, they lived in Bahrain’s castles, such as Arad Fort, the Court Castle and Bomaher Castle. Sheikh Mohammed bin Isa Al Khalifa (brother of the ruler of Bahrain back then, Sheikh Hamad bin Isa Al Khalifa) married the daughter of Dawood Bin Abdul Qadir Al Balushi (granddaughter of Haj Juma bin Jalal) and lived with her in Busaiteen in a neighborhood that was known as the Baluch neighborhood. As Sheikh Abdullah bin Homoud Al Khalifa married the daughter of Abdul Qadir bin Fadel Al Balushi. The United States, NATO and the Afghan government should not be trying to bring the Taliban to the negotiating table, but Pakistan. 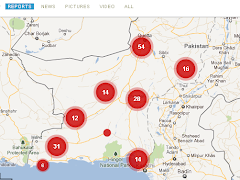 Located about 100 kilometers from the Afghanistan border in Kharan, Balochistan is one of the hundreds of outposts of Pakistan's permanent jihadi network. Far lesser known than al-Qaeda and the Islamic State, but considered by many to be far more dangerous, Jamaat-ud-Dawa (JuD) is Pakistan's favorite Islamo-nationalist jihadist group. JuD, which the United Nations say is a front for banned militant group Lashkar-e-Taiba (LeT), was originally a Punjabi-dominated organization, but, with the help of the Pakistani military expanded into Balochistan and Sindh provinces as a Islamo-nationalist tool to suppress ethnic separatism. "JuD was conceived and created as an organization that can run a modern state. That is why JuD placed equal stress on recruiting its members from all professions and gives training to its members in all fields of statecraft. Unlike al-Qaeda and ISIS, JuD members come from or have penetrated all government departments, from the Pakistani military down to municipal councils. Unlike al-Qaeda and ISIS, JuD is capable of reinventing itself and surviving." JuD is said to be operating under different names in 50 countries and reportedly has over 500,000 members in Pakistan, making it bigger than all other Pakistani jihadist groups combined. The terrorist group LeT, which is linked to the Pakistani intelligence service the ISIS, is better known, but in actuality, LeT can be considered one of the JuD departments, whose specific mandate is to wage jihad in the Indian Kashmir. Another JuD element, known as "International Affairs Department," under Abdur Rehman Makki, is responsible for global jihadist activities. 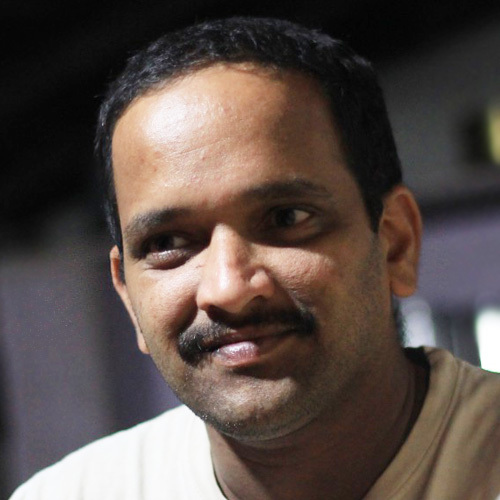 Arif Jamal has argued that the 2008 Mumbai terrorist attacks were a joint operation by the LeT and the JuD's International Affairs Department. As an indication of its official clout, after the 2013 Awaran earthquake, the Pakistani government barred UN agencies from carrying out relief activities, but allowed in 2,000 JuD volunteers to provide relief and recruit jihadis in close coordination with Pakistan's civilian administration and soldiers. According to local sources, the Kharan district chief of JuD and LeT is Mohammad Altaf Mullazai. He has five brothers and three sisters. Altaf is the eldest son of his father, Haji Saleh Mohammad Mullazai. Altaf's permanent residence is in Wapda Mohalla of Kharan, but he now spends most of his time in Quetta. Altaf's brother, Saleem Mullazai, fought with the Taliban in Afghanistan. Altaf's cousin Waseem is now in operational control of jihadi activities in the Kharan region, representing JuD and making frequent visits to the Pakistan Army base in Quetta. He uses a black Honda motorcycle and carries a 9mm pistol. Again according to local sources, Mohammad Altaf Mullazai is linked to Pakistani intelligence and Shafiq Mengal, related to a power struggle for Pakistani military money with Muneer Mullazai. Both Mohammad Altaf Mullazai and Muneer Mullazai have worked with the Pakistani military to suppress Balochistan nationalists. Mohammad Altaf Mullazai's associate, Shafiq Mengal is now, according to security officials in Quetta, leader of the Islamic State in Pakistan. As reported earlier, Shafiq Mengal is the son of former Pakistan state minister for petroleum and Balochistan's caretaker chief minister, Naseer Mengal. He comes from an influential and educated family, dropped out from Aitchison College in Lahore, and later attended an extremist Sunni-Deobandi theological school. In 2008, Shafiq Mengal organized a pro-government tribal militia known as the Baloch Musallah Difaee Tanzeem, which was considered a pawn of Pakistan's intelligence agency, the ISI, and enjoyed the confidence of the local Pakistani Army Frontier Corps. The Pakistani authorities saw it as being in the vanguard of the fight against Balochistan independence insurgents. Mengals's group soon degenerated into a local death squad, killing people for political as well as non-political, tribal or personal reasons. In the wake of the Pakistani government crackdown on al-Qaeda, the Pakistani Taliban and related domestic terrorist groups, Shafiq Mengal took advantage of the power vacuum created in LeJ to become one of the leading lights of the LeJ splinter group, Lashkar-e-Jhangvi al-Alami (LeJ-A), which has claimed responsibility for several bloody atrocities in Balochistan in the past year. Another presumed link in the permanent Pakistani jihadi network is located farther west in the Kech district of Balochistan, where Lashkar-e-Khorasan, a self-proclaimed Islamic State affiliate, is an apparent important player in an opium-trafficking region with active Taliban recruiting centers. The take-home message for the Trump Administration is that the Taliban represents only the tip of the Pakistani jihadi iceberg. The U.S. cannot achieve its stated objectives in Afghanistan under the current strategic conditions and should incorporate new tactics in a broader South Asia strategy addressing Pakistan's proliferation of Islamo-nationalism. That strategy could include fighting an insurgency with an insurgency by supporting secular Balochistan independence groups. 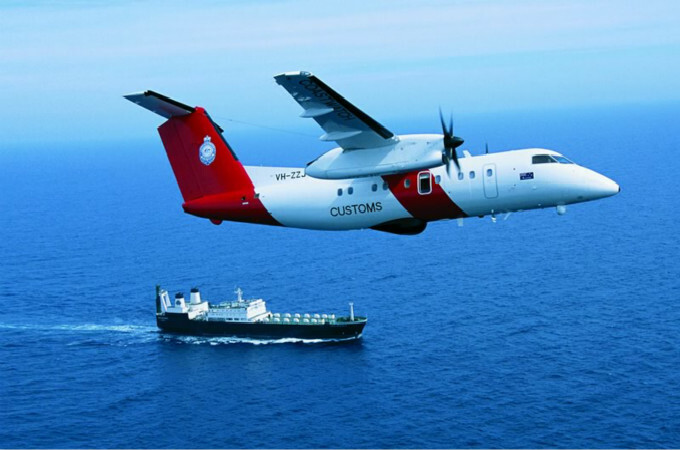 The Australian Department of Defence confirmed that last week a Chinese Dongdiao-class Auxiliary General Intelligence (AGI) vessel monitored the US-Australia Talisman Sabre joint military exercises from within Australia’s 200 nm Exclusive Economic Zone (EEZ). This “first-ever” Chinese incursion of its type in Australia’s EEZ has sparked both alarm and an international debate. Many say China is hypocritical because it is undertaking intelligence, surveillance, and reconnaissance (ISR) missions in other countries’ 200 nm EEZs while opposing those of the US in its own EEZ. But there are significant differences in scale, technological capability, methods, and objectives between what China and the US are doing. But the scale is very different. Ironically, the “different scale” argument was first used against China by China critics to demonize its occupations and “militarization” of features in the South China Sea. Although these critics grudgingly acknowledged that China was not doing anything other claimants had not done, nevertheless China’s behavior was singled out as unacceptable because of the much greater scale and “aggressiveness” of its activities. It seems that the tables are now turned. Although the critics argue that China is doing “the same thing” as the US, the scale of US ISR missions against China is probably an order of magnitude greater than that of China against the US. For example, as of 2017, PLAN had only three AGI vessels. Of course, China also has ISR planes, drones, and satellites but their number and capabilities pale in comparison to those of US assets. Indeed, the US has a huge array of ISR planes, surface vessels, submarines, and drones — many of which, like the subhunter Impeccable, have specialized functions. The US has by far the world’s largest and most capable force of signals intelligence (SIGINT) aircraft. Moreover, most of the US Navy’s top-of-the-line combatants like the Ticonderoga-class cruisers and the Arleigh Burke-class destroyers as well as its submarines are equipped to carry out SIGINT missions. Further, no other country matches the US’ number and array of robotic aircraft and seacraft (drones), particularly in terms of their range and advanced weapons and sensors, coupled with the necessary satellite and telecommunications support systems. US satellite IRS capacity greatly exceeds that of China. In terms of deployment, the US flies hundreds of manned ISR missions every year along China’s coast. There have been no public reports of similar Chinese aerial ISR missions off the US mainland coast. Technological capabilities, techniques and objectives are other major differences. Yes, China does insert ISR platforms into other countries’ EEZs — like that of Japan. But it is likely that Chinese technological capabilities and activities in terms of intrusive methods used and information obtained are so substantially inferior to and different from those of the US as to be in a separate, much lower category, e.g., passive listening versus active probing or electronic interference with, and even manipulation of, communications. A confidential US Navy-National Security Agency (NSA) report revealed by Edward Snowden shows that China’s concerns regarding America’s ISR missions off its coasts are justified. But in the case of ISR, it is the extent of capabilities that is not publicly known. To convince sceptics that there is anything near parity between Chinese and US ISR capabilities, those making the “China does the same thing” argument — especially those in the US Navy, need to reveal exactly what it is that the US is doing in China’s near seas so that all can evaluate it for themselves. Otherwise their arguments will fall on deaf ears, and independent and neutral analysts can only speculate based on what little is known. In general, it is known that US ISR assets collect communications between the target country’s command-and-control centres and radar and weapons systems, including surface-to-air missiles, anti-aircraft artillery, and fighter aircraft. Other US ISR probes collect “actionable” intelligence for expeditionary and irregular warfare. Incidents involving ISR aircraft like the EP-3 and the Poseidon 8A, as well as the US Navy ships Bowditch, Impeccable, and Cowpens, may have collectively included active “tickling” of China’s coastal defences to provoke and observe responses, interference with shore-to-ship and submarine communications, violation or abuse of the consent regime for marine scientific research, damage to the environment, and tracking China’s new nuclear submarines for potential targeting. If so, these are not passive intelligence collection activities commonly undertaken and usually tolerated by many states, including China. Rather they are intrusive, provocative, and controversial practices that may be considered a threat to use force or violations of both China’s marine scientific consent and its environmental protection regimes. This could occur when and if the Poseiden 8 drops sonobuoys (which are part of its repertoire) or the Impeccable and Bowditch deploy “scientific instruments” in China’s EEZ. Indeed, China’s EEZ environment may be degraded if US sonar systems or live fire exercises adversely affect fish and mammals like whales and dolphins. But much of this is unconfirmed. What do we — the public — know? A confidential US Navy-National Security Agency (NSA) report revealed by Edward Snowden shows that China’s concerns regarding America’s ISR missions off its coasts are justified. The 2001 report reveals that in the EP-3 incident, the crew was unable to destroy all the secret data and systems on board, and details the scope of secrets exposed to China. The exposed information contained the fact that the US has “the ability to locate and collect transmissions to or from Chinese submarines and to correlate them to specific vessels.” The plane also carried data that clarified “how much the US knew about China’s submarine-launched ballistic missiles program.” Also, according to the report, as speculated, the missions spur targeted militaries to react, thus creating communications that can be intercepted. So, it does appear that the US has a huge advantage over China when it comes to ISR. But unlike Malaysia, Thailand, and Vietnam, China does not oppose all foreign military activities in its EEZ without its permission. Nevertheless, China certainly does object by word and deed to what it perceives as US abuse of the right of freedom of navigation and a threat to use force. In sum, China apparently believes that these activities violate the peaceful purpose and uses provisions of UNCLOS, as well as its UNCLOS EEZ resource rights and environmental obligations. China also thinks that the US is “preparing the battle field” and that this constitutes a violation of the UN Charter as well as UNCLOS. In particular, China alleges that the US is not abiding by its obligation to pay “due regard” to its rights and duties as a coastal state. Such due regard in the EEZ is required by UNCLOS for both the coastal state and the user state, but is undefined. Yemenis are masters of making do, and the civil war there has done little to dent their capacity for innovation. Sana’a, the capital, now has the greenest energy supply in the world, residents claim, because so much of its electricity is produced by solar panels. The country has all but run out of foreign currency but networks of Yemeni businessmen have been able to jerry-rig a surprisingly effective hawala or informal money transfer system that has allowed workers outside the country to send cash back home, for a fee. Until recently traders and transport firms had to contend with tribal roadblocks, armed gangs and Al-Qaeda. But now, because so many of the militias earn income from taxing trade, security along the country’s roads is actually as good as it has ever been – as long as you aren’t a combatant involved in the wider conflict. Several businessmen questioned for this article estimate that the cost of paying ‘tax’ at checkpoints and revenue posts established by Yemen’s rival governments increases the cost of goods by about 10-15 per cent. Wealthier Yemenis are able to absorb the costs, and clearly there is still some money left in the country: as The Economist has reported, while a cholera epidemic rages in the midst of one of the world’s worst humanitarian crises, the Sana’a branch of Baskin-Robbins remains plentifully stocked with ice cream transported to the capital in refrigerated lorries. The fact that goods still crisscross the country is broadly good news. But there is a darker side to Yemen’s war economy. A businessman, who asks not to be named, says he can get ‘pretty much anything’ from Jebel Ali port in Dubai to Sana’a within 48 hours, 72 if there is fighting along the way. Other goods are being shipped in to ports in Oman, which sits between the United Arab Emirates and Yemen, and from southern and western Yemeni ports, and receive even less scrutiny, as long as the right palms are greased. Of course, the businessman says, he has nothing to do with bringing arms or other illicit items into the country – but he is sure that others are feathering their nests by doing a little gun-running. My current research on Yemen’s civil war, to be published in a paper for Chatham House later this summer, asks much the same question: why stop? Diplomats working on Yemen and other similar conflicts tend to insist that the different groups involved in these wars must see the benefit of ending the conflict and working together for a peaceful and sustainable future. But the more I speak to Yemenis with insight into the thinking of politicians and armed groups involved in the conflict, the less convinced I am by the diplomats’ optimism. With the front lines of the Yemen war largely static for the better part of two years, and previously marginal groups now in control of swaths of territory including lucrative trade routes, the incentives for many militia leaders point to sustaining the conflict – especially since most groups operating on the ground have not been asked to participate in Yemen’s UN-led peace process. Yemen’s internationally recognized government spends much of its time outside of the country. The President, Abd Rabbu Mansour Hadi, who was ousted in early 2015, is based in Riyadh, the capital of Saudi Arabia, rather than Aden, the southern port city he named as the seat of government after fleeing Sana’a in early 2015. The Hadi administration is said to be happier living in the Saudi-funded comfort of Riyadh than in Aden, where the situation is volatile. They have little in the way of skin in the game, although Hadi allies are said to be profiting from monopolies on fuel supply into Aden, one of the few cities they nominally control. Then there is the odd-couple alliance that controls much of northwestern Yemen. The Zaydi Shia rebels, called Houthis after the movement’s late founder, Hussein al-Houthi, seized Sana’a in September 2014 before expanding into the rest of Yemen. It soon became clear that they had the backing of military units loyal to former president Ali Abdullah Saleh. Once Hadi had fled the capital, the Houthis formed an uneasy political alliance with Saleh’s former party of government, the General People’s Congress. GPC members have witnessed the rapid destruction of a state they helped build – along with personal fortunes tied to the country’s now-shattered economy. They would like the war to end, but not if it means Hadi and the Saudis rule the roost – nor if their Houthi partners, whom many privately revile, come out on top. For Houthi militia leaders, however, the war has been a path to expanding power and wealth. Many of the group’s commanders started off as penniless rebel fighters in the Houthi heartlands of Sa’dah in the early 2000s. After the Houthis seized Sana’a, the United Nations announced sanctions against their leader, Abdel-Malek al-Houthi, and their top-ranking military commander, Abu Ali al-Hakem. Neither man, it was said at the time, had a bank account or a mobile phone contract. ‘Can you sanction pay-as-you-go credit?’ a Houthi supporter joked. Today, men such as Abu Ali, barely out of his teens when the Houthi rebellion began and accustomed to a life of war and economic privation, now control militias thousands of men strong across a number of provinces and earn their own cash. It is hard to believe that the Houthis’ military leaders feel that they are losing, particularly the movement’s more religiously motivated members, who genuinely see their path as divinely mandated. Elsewhere in the country, the local government that controls southern Hadramawt Province is making so much from taxing goods entering Mukalla port that it can pay for infrastructure repairs, basic medical services and electricity, albeit with a little help from the UAE. In Marib, in central Yemen, the governor, an important tribal leader, has been able to fund services by selling bottled gas produced at an oilfield in the province. While money made in such ways is not enough to prevent Yemen’s poor from inching towards famine, it does provide the resources needed to keep the different militia and political leaders in power. That is problematic because the UN-mediated peace process calls for the Houthi-Saleh alliance to cut a deal with President Hadi’s faction and form a ‘unity’ government, which would almost certainly demand that revenues from taxation and oil and gas sales go to Sana’a. That is likely to be a non-starter for many local groups, who have little love and less trust for the Hadi government, the Houthis or Saleh. And this is before they are asked to give up their guns. There is a bigger problem though: despite the humanitarian crisis, the current set-up seems to suit most parties, to the extent that they would appear to be quietly cooperating with one another. Fuel imported to Mukalla is transported knowingly to Sana’a. Guns provided to anti-Houthi-Saleh fighters on the ground are sold to the other side. In Mareb Province, the main highway is cut by a front line, as you might expect in a war zone. But on another, less well maintained road to the south, lorries drive through pro and anti-Houthi checkpoints a mountain pass apart. The war economy has evolved into a system that, for those with guns, is sustainable as long as the status quo is maintained. This is not to say that Yemen’s civil war has just become cover for cosy cooperation between future cronies. Heavy fighting is still taking place in Taiz city and Al Beidah province. Yet neither battle is likely to be decisive. So the Hadi government and the Saudi-led military coalition that backs it increasingly see the economy as the only way they can gain leverage over the combined military might of the Houthi-Saleh alliance. In September 2016, President Hadi said that he was moving the headquarters of the Central Bank of Yemen from Houthi-Saleh held Sana’a to Aden. The stated reason was that the rebels had been looting the bank’s supplies of riyals and dollars. But western governments had warned that removing the central bank, and losing its stock of well-trained technocrats, would disrupt the economy and deepen the humanitarian crisis. Many observers wonder if this was not part of the plan. Since late 2016, the Saudi-led coalition has been considering a military offensive against the Houthi-Saleh controlled port of Hodeidah on Yemen’s west coast. The coalition says that it wants the port because the alliance is using it to bring in Iranian weapons. But it is hard not to see the move as an attempt to squeeze the rebels economically and force them to agree to a peace deal favourable to the Hadi government. About 70 per cent of the country’s imports come in through Hodeidah and aid agencies predict famine if the port is out of commission for more than a few days, while military planners think a successful offensive would last for a few weeks. In early July the chairman of the Russian Historical Society addressed a gathering on how the country should mark the centenary of the revolutions of 1917 which toppled the Romanov dynasty and then brought the Bolsheviks to power. The Russian people, he said, should avoid ‘radical’ assessments of the events of 1917 and rather find in them ‘a source of national unity’. ‘Radicalism is generally harmful,’ he said, adding that ‘such momentous events [as those of 1917] cannot be painted in black and white’. The Russian Historical Society is officially an umbrella organization for Russian historians as in any other country, but in fact it exists to deliver government talking points on ideological matters. Bizarrely, its chairman is not a professional historian but none other than Sergey Naryshkin, director of the SVR, the Russian foreign intelligence service. The key word ‘radicalism’, uttered by the country’s top spy, reveals the depth of unease with which the Kremlin greets the anniversary. Russia’s rulers – Soviet people through and through as far as their upbringing, views, tastes and political perceptions are concerned – are deeply worried because 1917 was the year of revolution ... and revolution is something that the Kremlin fears. Ten years ago, when the country marked the 90th anniversary of ‘the year of two revolutions’ there were more TV programmes, conferences and books on the subject. There are visibly fewer such activities today. One project that attracted a lot of attention is ‘1917: Free History’, created by journalist Mikhail Zygar. It paints a vast panorama of political, military, cultural and societal events of the revolutionary year with diary entries and letters by hundreds of the era’s protagonists presented in the form of imaginary social network posts. Apart from this project – not much. Paradoxically, the Kremlin’s reticence regarding the anniversary of the 1917 February and October revolutions stands as indirect proof of the dates’ lasting importance today. Vladimir Putin’s Russia is a country in which history plays a pivotal role in maintaining the legitimacy of the political regime. Putin sees himself as a leader that has given the Russians back their sense of pride. Ever since becoming president in 2000 he has been hard at work at whitewashing the Soviet period of Russian history and creating an uninterrupted narrative linking the Romanov Empire, the USSR and modern Russia. Not unlike the official French version of history, Putin’s Russian story is all about greatness – but with a twist. While France with all its respect for l’etat still sees itself as the cradle of human rights and dignity, Putin’s version of Russian history is all about the glory of the state and the people’s perennial readiness to sacrifice themselves for it. For such a narrative, 1917 is a particularly tricky moment. On the one hand, older people, those who remember the Soviet Union, still see it as ‘their’ state. For them, 1917 is a date when this state came into being. These people also happen to be the bedrock of Putin’s support. They tend to see Vladimir Lenin in a positive light. But for most of these citizens, the revolution is rather a part of their Soviet nostalgia than a call to arms. For a significant minority – mostly the electorate of the Communist Party of Russia – it is still a shining example of social justice at a time when Russia, according to a 2015 report by Credit Suisse, is the most unequal among the world’s major economies with the richest 10 per cent owning 87 per cent of all the country’s wealth. On the other hand, the Russian Orthodox Church, quite justifiably, sees 1917 as the year militant atheism triumphed and nearly destroyed religious life in Russia. At the same time its condemnation of the Communist regime that ruled in Russia for the best half of the 20th century is not wholehearted. Patriarch Kirill regularly calls on the Russians to recognize the ‘positive sides’ of the Soviet period of history. Despite state atheism, the moral foundations of Soviet society remained rooted in Christianity, he told a visiting delegation of Orthodox clerics from the US in May. The patriarch compared the USSR favourably with the current state of affairs in the West, which in his words is ‘losing its Judeo-Christian foundations’. The Russian church has a particularly delicate balancing act to perform – a significant part of its faithful and clergy consider the events of 1917 a ‘Jewish-Masonic plot’ to destroy ‘Holy Rus’. These people see Lenin and the early revolutionaries as agents of this conspiracy while treating Josef Stalin as a man who reversed the trend, eliminated the Leninist ‘old guard’ and recreated the Russian empire under a new name. In 1943, at the height of the battles to beat back German armies in the Second World War, Stalin allowed a few Russian bishops who were lucky enough to survive the purges of the 1920s and 1930s to elect a patriarch and rebuild some church structures under tight government control. This gives an additional boost to his popularity among many Orthodox church-goers who see the Soviet dictator as a ‘saviour of Orthodoxy’. Patriarch Kirill, the first in history to be born in and raised in the USSR, cannot ignore this trend in his own church. As if to complicate things even more, memory of the White movement, which stood up to the Bolsheviks and was defeated by them in 1922, is also controversial. The majority of Russians today are descendants of peasants and workers for whom the revolution undoubtedly provided unprecedented social advancement – if at a great cost. But ‘the Whites’ – aristocrats, merchants, intelligentsia, rich farmers – are also a vital link to more than a thousand years of Russian history with its cultural richness, military glory and the pomp and ceremony of the Romanov Empire. This makes them also indispensable to the Kremlin. In the early 2000s Vladimir Putin personally supervised the reunification process of the Russian Orthodox Church and Russian Orthodox Church Abroad, founded in the 1920s by emigre bishops. Putin cultivates descendants of White Russian émigré families, including the Romanovs. The authorities have repatriated to Russia for reburial the remains of those who were forced to spend their lives in emigration – White Russian commander general Anton Denikin, monarchist philosopher Ivan Ilyin, and the writer Ivan Shmelyov, known equally for his idyllic recreations of life under the Tsars in a childhood memoir The Year of Our Lord and hair-raising descriptions of the Red Terror in The Sun of the Dead. Putin enjoys seeing himself as an inheritor of the Tsarist legacy. He could not hide his satisfaction when during a pilgrimage last year to the Russian monastery on Mount Athos he was seated on the throne reserved for the emperor. This strategy has partially paid off, with many scions of prominent Russian families supporting the 2014 annexation of the Crimea as a return of Russia’s imperial greatness and ‘an act of historical justice’. Adding to the Kremlin’s difficulties is a minority – no more than 10 per cent of the population – that refuses to see the 1917 events in a cool and detached way, as the country’s spy chief advises. They view it as Russia’s greatest tragedy that cost the country tens of millions of victims of the civil war, famine, the Gulag and military adventurism. It may seem strange but this minority gives Putin his biggest headache, because one thing that he studiously avoids is any attempt at moral judgment in history and politics. To paraphrase Lenin, for the Russian president anything is moral that serves the interests of the Russian state – and his own. Those who condemn the Communist regime as immoral tread on true revolutionary ground. By refusing to accept any equivalence between good and evil, they undermine the Kremlin’s cynical narrative of the state interest always trumping the individual to achieve some higher goal – modernize the country, win the war, conquer space. It is not for nothing that Putin during his 17 years at the top of the power pyramid has denied political representation to this 10 per cent. They are the democratic parties that the Kremlin banned, took over and denied publicity and financing most. No doubt that Putin dislikes leftist and nationalist radicals as well. His attitude to them fluctuates between toleration and sporadic, selective repressions. However, they have one thing in common with the president’s world view – they share his worship of the state. The disorganized and dispirited Russian democrats do not. And this makes them especially dangerous in the eyes of the Kremlin. What could have been the year of an honest national conversation about overcoming the tragic past and charting a course towards the future turned into 12 months of tepid enforcement of an imaginary national unity by the leadership that fears historical truth and likes to construct historical myths. The year of two revolutions remains contentious and unexplained to the public at large. And as long as it does, the Russian civil war is not over. After a world court tribunal ruled last year in July that Beijing lacked legal rights to claim most of the South China Sea, it stepped up talks with the chief maritime disputant Vietnam. Vietnam and China contest sovereignty over the sea’s two major island chains and a lot more. Both remember deadly naval clashes in 1974 and 1988 for control over some of those islets. Three years ago, anti-China riots broke out in Vietnam after Beijing let a Chinese offshore oil driller park a rig 240 kilometers east of the Vietnamese coast. Now they’re at it again despite all the talking. This dispute has pushed Sino-Vietnamese ties to a one-year low that will probably last a while yet not lead to any use of force. The latest problem began when Vietnam and a Spanish contractor set out in June to explore for oil or natural gas beneath the seabed near Vanguard Bank, which is under Vietnamese control, say analysts who follow Southeast Asia. Beijing says that feature in the Spratly chain rightfully belongs under its flag. It may separately resent the influence of India, a not-so-pro-China country without a claim of its own to the disputed 3.5 million-square-kilometer sea. Vietnam this year extended a deal with the overseas subsidiary of India’s state-run firm ONGC to explore for fossil fuels in a tract that China contests. China says about 90% of the sea is its own, including tracts that overlap the exclusive economic zones of Brunei and Malaysia. It has landfilled disputed islets for military installations to bolt down its claims. Five other governments claim parts of the sea. Vietnam, which has also fought China over a land border, historically has been the most outspoken. In June a Chinese Central Military Commission vice chairman cut short his visit to Vietnam, the official Xinhua News Agency in Beijing reported. It didn’t say Vietnamese oil exploration prompted the official to leave early, but experts call that the chief reason. In late July China strongly pressured Vietnam to withdraw from the tract near Vanguard Bank, analysts believe. Neither government wants another clash by force, so analysts expect them to keep talking, possibly at the Communist Party-to-Communist Party level at first. But that dialogue would only dampen the dispute, not solve it. The core disagreement just runs too deep. Historical parallels are a curse of our time because they prevent rational analysis of social and political processes. Once you hear that 2014 is 1914 all over again, or that a certain regime is heading towards a new Nazism, this is a clear signal to stop listening, as clear as when you are advised to read Dostoevsky to gain insight into the ‘Russian soul’. It is time to stop taking Karl Marx’s joke at face value: history does not repeat itself, either as tragedy, or as farce. Since there is an infinite supply of historical facts, it is likely that striking similarities between past and present events are based either on the magic of numbers – 1914/2014 – or on highlighting some facts while ignoring others. The main sin of parallelism is that it negates progress. It is stuck in the Middle Ages, when the wheel of fortune decreed that nothing changed. The same type of thinking that denies the passage of time, however, makes a fetish of space and turns geography into destiny. People who balk at a comparison between the Russian and Venezuelan political systems are happy to compare modern Russia with the Russia of Ivan the Terrible, Nicholas II or Stalin, periods that have nothing to do with our time economically, culturally or socially. So what are we to make of this year’s centenary of the revolutions that ended the Russian Empire, and the fashionable search for clues to the future of today’s Russia? To unpick the parallels, it is worth exploring the basic composition of Russian society then and now through demographic trends − while understanding that demography influences, but does not determine, political processes. Looking at the demographic data of Russia for 2016 and for the Russian regions of the Empire by 1917, we see two major trends that shaped the 20th century: ageing and urbanization. The median age of a Russian citizen of today is 39 years. In 1917, the average age of a resident of Petrograd was 19. In 1885, there were 11.6 million city dwellers in Russia, a figure that doubled within 30 years to 23.2 million in 1914. In 1940 the urban population of the USSR was 60.6 million people and in 1956, 87 million. Within 40 years, 54 million people had moved from village to town. By the late 1950s, the urban population equalled the peasantry. Urbanization was a feature of the era that transformed agrarian societies into modern industrial ones. The grimmer appendages of this process were global wars of the type unknown to previous ages, combining the genocidal intent of Genghis Khan with new weapons capable of wiping out millions of lives. The young people wanting to climb up the social ladder by moving from the countryside to the cities could play two roles: as the drivers of progress or the cogs in great totalitarian machines of repression, as happened in Russia and China. There are gaps in the Russian demographic pyramid that we see repeated roughly every 20 to 25 years. These are the traces of the horror that was the Russian 20th century – mostly the human loss of the Second World War, but also of the civil war, collectivization, numerous waves of genocide and organized hunger. If you compare the modern demographic pyramids of the former Soviet republics, you will see a picture resembling the Russian pyramid, but with the edges somewhat smoothed. Today 74.4 per cent of the citizens of Russia live in cities, according to Rosstat, the Russian statistics service. Agrarian Russia, the Russia of the peasantry, is now the stuff of folklore. Given the state of the transport and road infrastructure, it is reasonable to assert that Russia today consists of 15 cities and their agglomerations, with more or less empty space in between. There are two exceptions: the agricultural regions of Southern Russia and the national republics of the North Caucasus. Remarkably, these are also the regions with distinct political cultures and electoral behaviour differing from that of central, northern or Siberian Russia. Ethnically, if we compare the results of the censuses of 1991 in the Russian Soviet Federative Socialist Republic, as the territory of the Russian Federation was defined in Soviet times, and the last census of 2010, we see a gradual consolidation of the ethnically Russian population. Non-Russian Judeo-Christian ethnic groups are declining or disappearing: Jews, Germans, even Ukrainians and Belarusians are markedly less numerous in 2010 than in 1991. The sole exception is the Armenians. At the same time, there is quite significant growth of those ethnic groups that can be described as Muslim: the Azeris, the Tartars, and the Caucasian nations. Very roughly put, in the Russia of today we see two groups of unequal size, but also with unequal demographic dynamics: the generalized Russian and the generalized Muslim nations. Having said this, it is important to remember that these are not actual ‘communities’ or even ‘ethnic groups’: there is not so much in common between the Kazan Tatars and the Chechens, while the ‘Russian’ Russians are extremely diverse. These statistics, of course, can be readily used for all kinds of political catastrophism. They can be turned to support nationalistic propaganda of the ‘let’s declare a mono-national state before it’s too late’ type, or the ‘Russians are all dying out and being replaced by people from the Caucasus’. In fact, Russia is not dying out in any perceivable way, the birth rates being moderately low, but on a par with the general level of countries of comparable economic status and social composition. Looking at the demographic pyramid of 2016, we see not just an old, but an ageing population, with the predominance of women growing with each rise up the age scale. This is due to the difference in average life expectancy between the genders: men die sooner, and the more pronounced gender inequality starts after 55 years. Life expectancy has been slowly growing for the past 15 years yet according to data for 2016 it is still a shockingly low 66.5 years for males and an almost decent 77 years for females. The real Russian demographic problem is not low birth rate, but early mortality, especially male mortality, which is almost totally due to preventable social causes: alcoholism, driving accidents, violent crime, high prison population and treatable diseases, most importantly cardiovascular. There is a total absence of what demographers call a ‘youth bulge’ − a disproportionately high number of 15 to 25-year-olds in the population pyramid. Such a youth bulge was very visible in the population pyramid of Germany in 1933, the year Hitler was appointed Chancellor, and − in a milder form − in Russia in 1927. Today we have instead what might be termed a youth gap − a visible failure below 25 to 29 years caused by the relatively small generation born during the first half of the 90s. The following 15 to 19 stratum is even smaller − a continuation of the low fertility of the second half of the 90s and early 2000s. Since 2002, the birth rate has been gradually increasing, and at the base of our pyramid we see two decent-sized ‘bricks’ −Russians aged 10 years or less. Their participation in the political process is yet to come. What does this demographic picture mean for a country’s political development? Always keeping in mind that demography affects but does not determine political processes, it is possible to discern some tendencies. With women aged 45 and older becoming the predominant social group in Russia, this creates the impetus to shift the policy agenda towards social issues − healthcare, education, a comfortable living environment. This is in marked contrast to official budget priorities, focused on security, the military and costly foreign adventures. The decision-makers of the ruling bureaucracy are largely males aged 60-plus, with military, secret service and law-enforcement backgrounds. Their values and interests may be not as aligned with those of the Russian majority as they would like to think. Demography is an important factor that affects a country’s likelihood of edging towards authoritarianism. Poor demography isn’t a death sentence; however, the existence of a ‘youth bulge’ correlates with a society’s proneness to violence. When the majority of the population in a country is over 40, protests are more likely to be peaceful and legal. At the same time, an older population has no effect on the probability of a military coup, the other bane of semi-autocracies that don’t have a politically valid mechanism for the transfer of power. While young people go to demonstrations, older people go to elections. By casting their ballots, the old deliver the results required by the authorities and also agree to accept them as legitimate. The latter is an important factor in a political system that relies heavily on falsifications and the use of the ‘administrative resource’ to boost turnout and achieve desirable voting outcomes. If younger Russians neither vote nor take an interest in election campaigns and their results, it erodes the election’s legitimacy, making protest activity a more attractive option. The next generation gap, stemming from the relatively small generation born in the 1990s and early 2000s which is now entering its fertility age, will ensure a continuing need to replace the shortfall with migrant workers. This, inevitably, will form the basis of continuing political tensions for the next 15 to 20 years. In a longer perspective, we have the continuing ultra-urbanization process that will draw Russia closer and closer to the picture of ‘15 great cities with empty spaces in between’. These are: Moscow, St Petersburg, Novosibirsk, Yekaterinburg, Nizhny Novgorod, Kazan, Chelyabinsk, Omsk, Samara, Rostov-on-Don, Ufa, Krasnoyarsk, Perm, Voronezh and Volgograd. Close behind are Krasnodar, Saratov and Tyumen. The cities of industrial Siberia − Tyumen, Krasnoyarsk, Tomsk, Novosibirsk − and Southern Russia and the North Caucasus − Makhachkala, Krasnodar, Rostov-on-Don − demonstrate the most stable population growth in recent years, both due to natural birth increase and migration. These 15 to 18 cities and the surrounding territories serving them will inevitably strive to become both sources and centres of political power. This is in direct opposition to the current political system that has all-but abolished direct mayoral elections, crushed the freedoms and financial independence of municipalities and strives to uphold at least the appearance of a ‘vertical of power’ by heavy dependence on regional authorities − which, in their turn, are kept under control by a centralized budgeting system and the threat of criminal prosecution. Both varying demographic dynamics and migration rates will widen the differences in ethnic composition between different regions and between the smaller towns and the megapolises. The core Russian territories are growing more and more uniformly Russian (and its towns are experiencing population decline), while the bigger cities present a globally familiar picture of ethnic and religious diversity. Today even Moscow is, by international standards, almost a mono-ethnic and certainly a mono-racial city as compared with New York or London, but this will change in the coming decades. Already today the mayor of Moscow is from the Far North and the deputy mayor is from Tatarstan, a cause of some political discontent. In future we are likely to see people from Kazakhstan, Kyrgyzstan and other parts of Central Asia who want administrative and political careers in the capital. Today’s social tensions are often created by the average Russian’s suspicious attitude towards both working migrants in the cities and non-Russians in the administration, the courts and the police. In the foreseeable future the ethnic shifts described above will dangerously increase those tensions, if they are not absorbed and co-opted by working political institutions, competitive public politics and pluralistic media − not exacerbated or exploited by the state-run media’s short-sighted propaganda and a monopolistic ruling elite which makes little room for the generations below them who are keen for their turn at power. China’s Belt and Road Initiative (BRI) is its new grand strategy. Chinese leaders have emphasised that the initiative is a win-win solution whose economic benefits will be shared across continents. South-east Asia has become a major focus of this strategy because it constitutes a significant sea lane for China’s maritime trade. Therefore, it is not a surprise that China first declared its nascent idea of reviving the maritime Silk Road in Indonesia during Premier Li Keqiang’s visit in October 2013. Mainland South-east Asia also offers China alternative routes to seaports for its landlocked provinces. The sub-region is hence included in Beijing’s plan to develop transport links and industrial parks. Thailand has realised that situating itself in China’s blueprint is economically beneficial. Thai leaders have expressed their support for the BRI since it was launched. Thai Prime Minister General Prayuth Chan-ocha, for example, has lauded this initiative for its potential to enhance the Thai-Chinese strategic partnership. However, General Prayuth was not among the heads of government attending the inaugural Belt and Road Initiative Summit on May 14 and 15 this year in Beijing; five Thai ministers attended instead. How can we interpret this event? How are we to understand the current stage of Sino-Thai relations and South-east Asia’s general relations with China? The Sino-Thai relationship has been cordial, marked by no major conflicts. Beijing’s endorsement of the 2014 military coup in Bangkok has even deepened ties, as the Thai military has since favoured China’s policy in many aspects. Therefore, the recent lack of an invitation for Thailand’s premier to the BRI summit raised eyebrows. The Thai Foreign Ministry explained that China did not extend an invitation to Gen Prayuth because Beijing had already invited him to another important event — the Ninth Brics Summit scheduled to be held in Xiamen next month. In the broader context, in fact, the Thai Prime Minister was not alone; leaders from Brunei and Singapore were also excluded from the summit. However, Thailand is an active player in continental South-east Asia and a long-term friend of China. It is also within the Indochina Corridor — one of six major economic corridors in the BRI blueprint that links south-western China to Singapore. It appears that the unresolved deal on the Sino-Thai high-speed railway project had become an irritation for Beijing and was the main reason for China not inviting the Thai leader to the summit. Why is the railway project in Thailand so important to China? In fact, Thailand and China had shared the idea of expanding the transport network between China and mainland South-east Asia since the early 1990s. In 1993, the two countries developed a sub-regional framework called Quadrangle Economic Cooperation, which focused on this issue. However, the Asian Development Bank subsumed it under its broader Greater Mekong Sub-region framework because of Thailand’s economic difficulties in 1997. The tangible outcome was the completion of the Western Sub-corridor route in 2010, linking Kunming to northern Thailand via Laos and Myanmar. With that continuing idea, China’s focus has shifted from roads to railways. There is also a strong sentiment in Thailand in favour of upgrading the country’s outmoded infrastructure, and the expansion of the rail network has emerged as an option. Therefore, BRI is not totally new but rather a more expansive and ambitious version of an older plan. Thailand and China have discussed the construction of a high-speed rail since 2010, when the Abhisit Vejjajiva government was in power. The two countries signed a memorandum of understanding (MOU) to set up a joint venture company in which Thailand would hold a 51 per cent share. Thailand agreed to allow China to utilise the land along the existing railway for 50 years. However, the agreement was aborted when Parliament was dissolved in 2011. The second attempt took place during the Yingluck Shinawatra government in 2012, which proposed four lines for the high-speed trains, stretching from Bangkok to the north, the north-east, the east, and the south. Thailand invited China to invest in the north-eastern line, as it would connect to the China-Laos high-speed railway running from Kunming to Vientiane, opposite the Thai border. The two countries signed MOUs in 2012 and 2013 for feasibility studies and the training of Thai personnel. However, the project drew public criticism, especially from anti-government groups concerned with its cost and potential for corruption. The Constitutional Court finally vetoed the project in early 2014, and the Yingluck government was ousted by a military coup later that year. After the coup, the Prayuth government reviewed the project and sought to start construction in May last year to commemorate the 40th anniversary of Sino-Thai diplomatic relations. Both signed another MOU in late December 2014 that would let China build a railroad from Nongkhai province to Bangkok and to Thailand’s Eastern Seaboard, covering a total distance of 867km, but running at speeds of only 180kmh. Thailand agreed to take a Chinese loan, to be repaid in cash and in kind — in the latter case with agricultural products, especially rice and rubber. However, the long process of negotiations opened a Pandora’s box for the Thai government. The initial problems were related to the shareholding structure and to the interest rate on the Chinese loan. Thailand proposed that China hold a 70 per cent share in the project, but China insisted on a 60 per cent share unless it received the same benefits as in the case of the Chinese-Laos railway project. In that case, China had received the rights to develop the land along the railway and adjacent to stations for 50 years. Also, Thailand proposed that China lower the interest from 2.5 per cent to 2 per cent. Early last year, China finally agreed to offer a 2 per cent interest rate if the project was scaled down from a dual-track to a single track in the face of rising costs. At the Lancang-Mekong Cooperation Summit from March 22 to 24 last year in Hainan province, the Thai and Chinese premiers surprisingly announced that Thailand would finance the entire project through domestic loans and that the speed would be 250kmh. China would only invest a 60 per cent share in work on the rail system and train operations, including the construction of bridges and tunnel excavation. To put the exclusion of Gen Prayuth from the BRI Summit in May in the context of the long process of negotiation, one may be able to infer how China has been asserting pressure on the Thai government. It was reported that the 17th meeting of the Sino-Thai joint committee on rail collaboration held on April 9 and 10 this year met with difficulties in coding construction materials from the Chinese coding system into the Thai system. The Thai Transport Ministry accepted that it might take a long time to do so. Without that, the committee cannot set the medium price in the project’s terms of reference and check whether the materials needed are available in Thailand. According to Thai law, such a joint venture cannot use foreign materials. However, the sentiment of the subsequent 18th meeting on May 24, nine days after the BRI Summit, turned positive. The two parties nearly reached an agreement on outstanding issues. The Thai Transport Ministry will now submit the detailed project to the Thai Cabinet for approval and aims to start construction by this month. Although details of the negotiations were not revealed, there was already a tendency for Thailand to accommodate China’s requests. In early June, a Thai deputy prime minister consulted the Councils of Engineers and Architects to resolve the technical issues and the use of Chinese personnel in Thailand. He proposed that the Prime Minister exercise his executive power under Section 44 in the interim Constitution. On June 15, the junta issued Decree No 30/2017 in the Royal Gazette to clear existing legal issues and allow the project to start. The decree exempts Chinese engineers and architects from taking Thai professional licence exams and allows the use of up to 25 per cent Chinese materials. The recent 19th meeting early last month concluded that the construction will start in October this year. ‘SHAME OFFENSIVE’: A NEW DIPLOMACY? The hurdles in the Thai-Chinese railway project offer several lessons. Chinese discontent suggests that Thailand is important to Beijing’s strategic planning in the BRI initiative. Certainly, the ultimate plan to link China with continental Southeast Asia would be impossible without progress in Thailand. Therefore, Thai policy makers may be able to utilise this advantage wisely to attract foreign investment to upgrade the country’s economy. Second, Thai policy makers cannot take China for granted and need to update their understanding of China. A history of cordial ties matters, but so does distance in time and generations. The new blood in Chinese leadership may not value the historical ties as much as its predecessors did. Hence, Beijing is less likely to compromise its national interest for the sake of maintaining a warm relationship with Bangkok. Third, China’s diplomacy has been a charm offensive focused on carrots, but now it is more willing to use the stick. Beijing is not reluctant to adopt shaming and intimidation when its national interests are affected. It is apparent that the absence of the Thai leader from the BRI summit was directly linked to the delay of the high-speed railway project. It looks like minor diplomatic intimidation, but it allowed Beijing to send a message about its unhappiness with the current situation. Furthermore, Beijing’s more assertive approach may also develop into a situation in which regional states need to choose sides. In the case of Southeast Asia, Beijing is now pressuring the region to favour China’s regional leadership. In Thailand’s case, the likelihood of Thai-American appeasement may also play a role besides the railway issue. Before the BRI summit, United States President Donald Trump made a phone call to three South-east Asian leaders — those of the Philippines, Singapore, and Thailand — with invitations to Washington. While Philippine President Duterte was non-committal, the Thai government accepted the invitation and has enthusiastically arranged an official visit. Beijing is perhaps sending a signal that it is unsatisfied being treated only as a political cushion and secondary power on which Bangkok can fall back whenever its relations with Washington grow rough. South-east Asia may need to realise that its attempt to engage with Beijing is not a one-way process. China is not only learning to cooperate through regional engagement. It also expects smaller neighbours to accommodate its rise and leadership. China’s use of diplomatic pressure indicates that South-east Asia may face more difficulties in dealing with Beijing in the future. While China’s power is growing, it may see the region’s old tactics such as silence, delays, indecisiveness, or enmeshing of multiple external powers as obstacles to its growing influence and interests in its own backyard. Beijing putting more pressure on South-east Asia to choose policies that at least do not obstruct Chinese interests is a likely future scenario. However, this situation benefits neither China nor South-east Asia. China’s punitive approach, if sustained, will only leave a negative image of Beijing and deepen suspicion of its intentions in the region. The mantra of peaceful rise and win-win cooperation may sound less and less convincing, and that could lead to repercussions that escalate tensions between China and Southeast Asia. However, the question is how South-east Asia can communicate this concern to Beijing and whether the latter will listen and re-evaluate its policy approach. Pongphisoot (Paul) Busbarat is Visiting Fellow at ISEAS-Yusof Ishak Institute. This is adapted from a longer piece that first appeared in ISEAS Perspective.